This handmade piece from our wine storage collection is as tasteful and elegant as it is useful and affordable. 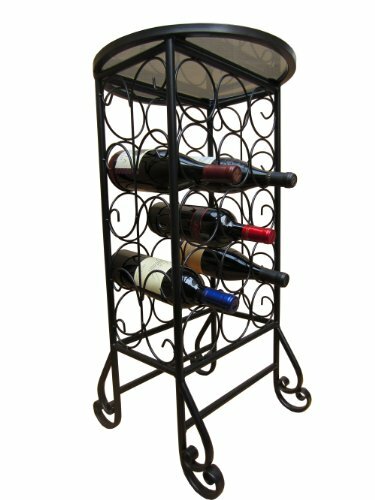 This wine rack holds 15 bottles of wine and has a durable powder coated finish. The swirl designs that gently weave their way through the frame greatly enhance the aesthetic appeal of the wine cage. The wine rack comes with a 3/16" flat polished gray glass table top. The diameter of the table top is 16". No assembly is required. This is an environmentally friendly product that has been manufactured from recycled wrought iron. If you have any questions about this product by PTC, contact us by completing and submitting the form below. If you are looking for a specif part number, please include it with your message.